Does your cat have matts? For my sewing and quilting friends. Do you obsess about throwing bits of fabric away? Up until recently, one thing I was very comfortable with throwing away was the selvages. Because what could you possibly do with them? Not any more. One day recently, I happened upon Karen Griska's Selvage Blog. I couldn't believe my eyes, I was so surprised at the neat little projects that I saw on this blog. She even a book called Quilts from the Selvage Edge. I'd love to look at the book sometime I'm at Chapters. Here is my first little 15" x 15" Selvage project. I was not sure what I would call it, but now, I think I'll call it my Cat Matt!!! I made this up in a couple of hours, just to get the technique down. This was a fun quick project. I'm back from Nova Scotia and a few days of power sewing. My sister and I worked on wedding things for a few days. We did really well, and are pleased with our efforts. Because she knows I love her cabbage rolls, we had them the first night we were there. She also gave me some to take home, frozen in small batches. I love that. Here is a picture she took just before she put the tomato sauce on them and put them in the oven. They were very good. I savoured every bite. I claimed leftovers for lunch the next day too. She refuses to give me the recipe. I now wonder if she's been getting them from the deli and passing them off as hers??? 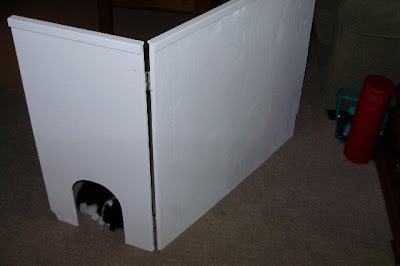 So, while the girls were busy sewing, the guys were in the garage building a kitty food station for my daughter Patience. Her daughter Aurora loves to get in the kitty food, so this should provide a barrier and a fun place for kitty to get respite from Baby A. We need to get some artwork to put on it.. it's looking kind of plain right now. On the way home today from Nova Scotia, we stopped into the Avonport Discount Fabric store. It's half way between Greenwood and Halifax. I was amazed at the amount of fabric they had and the wall of quilting notions. Every quilters ruler imaginable. I spent half an hour picking through fabrics and then just looking through notions. 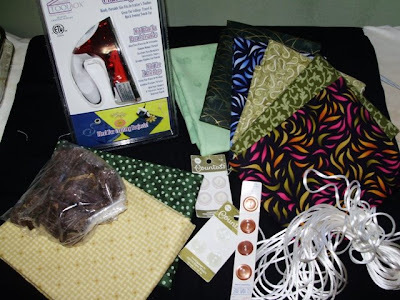 Here are my purchases... A craft iron (very hard to find in regular stores), 8 half yard cuts of cotton, buttons, white rattail, and chocolates. What you don't see is the hole in the chocolate bag. I had to try them. My sister says that this store is known for it's bulk chocolates. They are wonderful. When I go to Greenwood this summer, I'll know better and bring a few of my "to-do" patterns with me to get fabric. I was most impressed with the selection and price of the fabrics at Avonport. And finally, see who we brought home from Donna's house. Her name is Missy. She did well travelling today. So much so, we almost forgot she was with us. 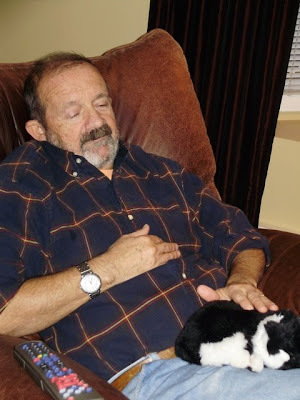 As you can see, she has taken up with Mert already, and found her comfy spot in the family room. South to Nova Scotia that is. On Friday Mert and I will travel to Moncton to visit with Carrie and Kenny and Jessica and Emily for a bit then head on to Greenwood, NS for a visit with my sister Donna and her hubby Terry. Today I finished up some little embroidery projects I had in the works and with that all done, I've started packing. While at my sister's house, we will be hanging out for a bit and probably sew some fun projects. 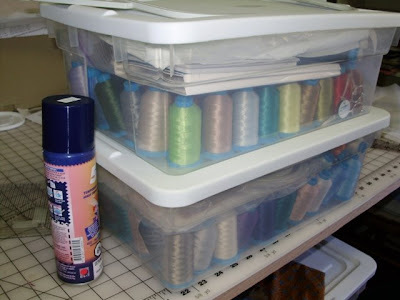 I can't believe how much thread I have. I love having all these colors. When you do embroidery, if you don't have the right shade of teddy bear brown, it's no fun, so to be save, it all travels with me. 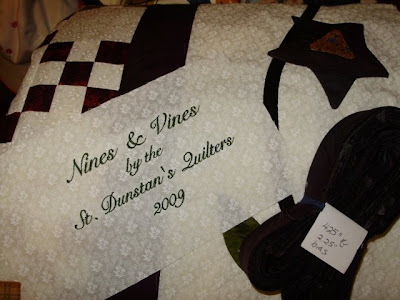 Also, after doing my little show and tell road show with the Nines and Vines quilt, I delivered it along with the prepared binding, and a label to Rose today. She was thrilled with the quilt. She paid me the nicest compliment. She said the quilts get nicer and nicer every year and what are we possibly going next year to top this one. I think it's true, but when I look back at the pictures, in fact, all the raffle quilts are all really nice. Also I was surprised today when I noticed a short comment in my "Done is Good" blog from last week. It's from Kathie, who is the creator of the Nines and Vines quilt for McCall's Quilting, and she was pleased that mine turned out so good. I'm always amazed at the connectivity the Internet gives us. Years ago, I used to buy Kraft Oil and Vinegar salad dressing. This was my favorite dressing...I could drink this stuff right out of the bottle. For some reason, about 15 years ago, grocery stores stopped selling this. I assumed that Kraft had stopped making it. But last fall, just about the time that we're closing up the cottage, I was in a little vegetable stand nearby, and there it was, sitting on a shelf. 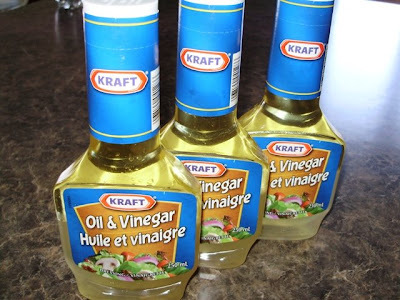 Kraft Oil and Vinegar. I bought it and I just couldn't believe that this little veggie stand had it. Along with all the vegetables and fruits, they carry about 15 products, milk, eggs, sugar, butter, pies, chips, ice cream and 3 different salad dressings. I picked up the oil and vinegar, looked at the expiry date, thinking, could they be selling 15 year old stock? Expiry date good... - at least for another month. I asked the cashier where she got it, and she said that the owner got it at Costco. I don't go to Costco, but I was pleased that it still existed. Then today, I was in Shoppers Drug Mart, picking up toothpaste and the like and we happened to be out of crackers, so I went down the 10 feet grocery aisle, and guess what was there. Yep, Kraft Oil and Vinegar. About 10 bottles... now 7 bottles. I'll be sure to let Shoppers know that I'm pleased that they carry it, and if they continue to carry it, they'll see me in there every week or 2 to get my supply! We had a special little visitor this weekend. Yes, it was baby Aurora. She's so smart now and she is not an infant any more. It's like overnight, she became a toddler. She moves around the house so comfortable and she's getting to know where all the hot spots are. The fridge, where she plays with magnets. The toy box, freshly cleaned out and various fun stuff inside. The stairs, she loves to climb them, just sit at the top... and have somebody carry her down, so she can climb up all over again. She likes the "I'm gonna get you" game. She squeals with laughter if she thinks you are chasing her. If you take one of her little hard page books, and start reading out loud, she scrambles to get on your lap as if to say, "You can't read without ME!" 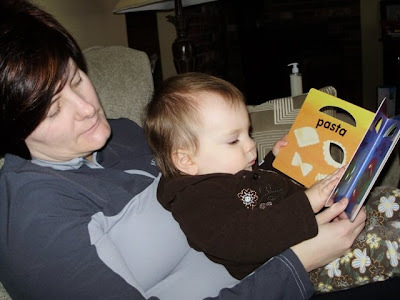 Here is a picture of Patience and Aurora reading one of her books. 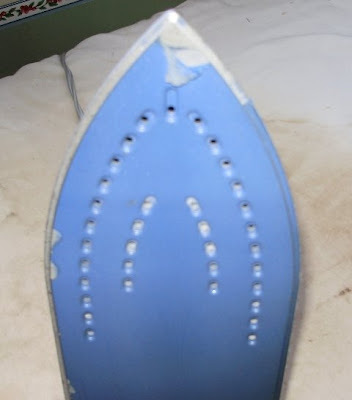 This iron has served me well in it's lifetime. It has only ever done fun work. No ironing shirts for this baby. Only quilts and quilty stuff. This week while making my appliques, I noticed that my star points were wrinkling up... I looked underneath, and sure enough the non-stick coating is peeling off the tip. I use the tip of my iron twice as much as the rest of the iron. Do you? So this week, I'll be looking for a new iron. Yes, my Nines and Vines is done. Now I can relax a bit. Great timing too, I have coffee with the Friday Girls tomorrow, so I get to take it there and show them first. Then on Tuesday night, it's our guild meeting, so I get to take it there and show what I've been doing.. And on Wednesday, I deliver it to Rose and she will show the St. Dunstan's quilters on Thursday afternoon. Then after that it will be marked before it goes on the frame for the hand stitching. I haven't blogged in a few days because I've been pretty much working on only this. I dreaded doing the applique, and I avoided doing any applique on anything for years. So finally, I said, this has got to stop and I decided to offer to do this one, with the intent of facing my applique fears. In the end, the applique went very well. I did a practice swatch using various stitches and feet. I did find a combination that worked good for me. It's trial and error for everyone I guess. I definitely I put more worry into the applique than I needed to. I did use the method of applique where I sewed each applique piece, (Stars, star center, and leaf) to a piece of very lightweight stabilizer, then trimmed to a small seam allowance. I then snipped a hole in the back of the stabilizer and with the help of a knitting needle and a drinking straw, I turned each of those FIVE pointed stars, 3 pointed star centers and 2 pointed leaves inside out.. The results worked great for me. What do you think? Next, I start to knit a sweater for Aurora. She grew out of her last one already... it's only been 6 months... oh, well. She'll be one year on Feb 7th, and we're planning a family birthday party here to help her celebrate. Tomorrow, I'm going to blog about some special mail that each of my grandchildren got this week! But now that the end is near, I find myself wondering on to other projects. I'm so excited for my boss... He and his wife are having their first baby in mid-February, and I'm preparing a baby package for him. This week, I've had waffle weave fabric on the brain for some reason. So thinking about this new little baby, I have a about a meter size piece of medium waffle weave - so I think I'll make a simple waffle towel/blanket for his baby to put in the baby package. I wish I knew what his name will be... I'll make the towel, and I can easily embroider on a name later. 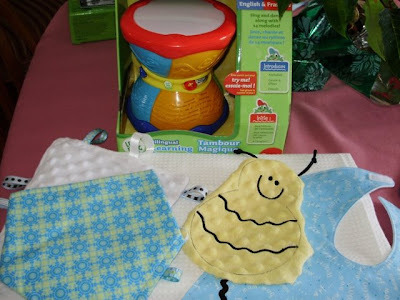 Also in the in the package for the new little baby, I have a couple of bibs, a couple of droolies, a nice Leapfrog drum, a little taggie blankie and a a little taggie bee (it's not finished yet). This package will be done up and gone by Friday. I love making baby stuff. I can't believe it's Friday already. My nines and vines is coming right along. The the 56 double 9-patch center blocks are all together and pressed. The 2 sets of outer borders are all cut out and ready for the vines and star flowers. The applique flowers are all set to be sewed to the recycled dryer sheet foundations before turning. 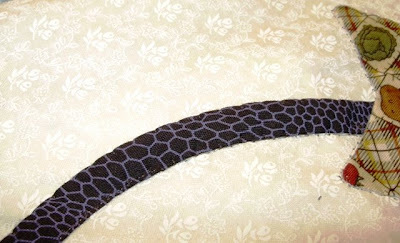 Today I did a practice sample of the vine border using the stitching with invisible thread. The ladies who I'm making this for, are very traditional and have always thought of applique as being done by hand. Machine applique is going to be a bit hard for them to swallow, but they've been dying to do a raffle quilt with applique on it for a change. So, after I did the sample and did a trial of 2 or 3 types of machine stitching the vine and other applique parts down, I took the sample to the head quilter... Rose. She was thrilled to see the quilt - in its almost done state... She looked at my sample and was pleased with any of the techniques. She couldn't believe how invisible it really was. We chose the bias bars method of setting the bias down, and it will be stitched on both sides. It's hard to see in my picture, but it is really quite invisible. Rose said the ladies will be pleased. So now that Rose is pleased, I feel more relaxed about finishing the borders.... I'm still on track as far as timing goes.... and plan on bringing this finished top to show and tell at Guild on the 20th... then delivering it to Rose on the 21st. Just to take a little break from the sewing machine, I decided to cut the border pieces for my nines and vines. I love making borders from lengths of fabric that I don't seam. So that means cutting borders from a long length of fabric. Yesterday afternoon, I roughly measured, straightened, folded, ironed, fluffed... then did my final smooth out before laying ruler and rotary cutter. I cut the first 2 strips, no problem, cut the third strip no problem, and was about to cut the 4th strip, and I couldn't figure out why I would have so much of a margin left over.. well over an inch, when it was supposed to be 1/2 an inch or less. Yep you guessed. One of my 8.5" wide borders is actually only 7.5 inches. Uggg..... It might seem like such a small deal, but this border has flowery stars appliqued on it and if I cut the other border side down to match , it would make the quilt 2" smaller in width. The St. Dunstan's ladies really want to make sure the width is a full queen size. (ticket buyers are always wanting a full queen size) Darn, Darn, Darn..... Oh, well, off to Fabricville for yet a 4th day in a row to get matching background fabric. I'll trim the other 3 border background down an inch and use these 4 border pieces in my next project. I have some left over small 9 patches as well, so I guess I'll get a Greco Pizza Box and start another Nines and Vines project box - for me. I really do like this pattern. So, the moral of this story is.. Haste doesn't make waste.... Haste makes a whole new project!! Do you see the cute little button tag on my scissors. These tags are from the Fons and Porter notions line and they come three in a package. 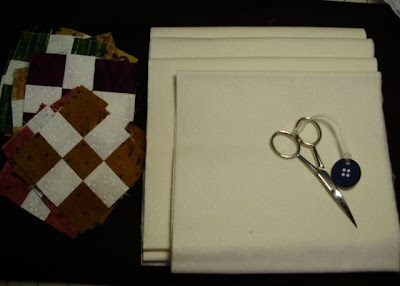 You put them on your sewing notions that you take to workshops and you can easily tell which scissors are yours. In my case, I like to have the tag on these scissors because they constantly are being covered up with fabric pieces and the tag gives them extra visibility. My daughter Michele gave me 2 packages of these tags for Christmas. I really like them. Not much going on in our household this week. It's going to be a relatively quiet week. A good week to sew. I know I wasn't going to update until next Friday, but it's quiet and there's not too much that I can blog about. I've tried to avoid going to Fabricville over the holidays. I was very adamant that I'm only working on my nines and vines and I'll not be distracted until that's done. But I have a good angel on my shoulder saying, "stay with it... you can do it, you're half way there"... then there is the bad angel that says, "ahh, head up to Fabricville...nines and vines will wait..you're half way there anyway so no problem.."
I do have good news.... all 56 of my double nine patch blocks are done. This afternoon, I start sewing them together.. 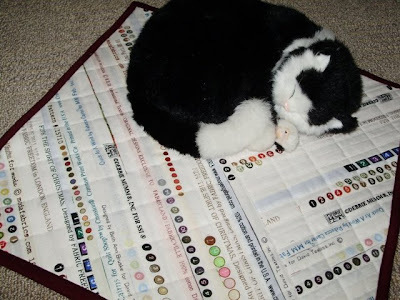 I'm now feeling that I'm into the swing of things on my Nines and Vines quilt. 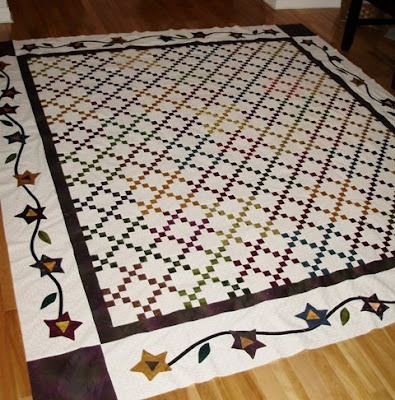 This quilt will be hand quilted by the St. Dunstan's Quilters over the spring and summer and will be used as their annual raffle quilt fund-raiser this fall. So, so far, this is what 21 of the double 9 patch blocks looks like. 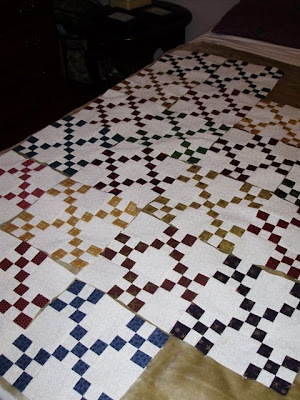 Altogether, the pattern calls for 56 blocks on the inner part of this quilt. If you look closely, there are 5 little nine patches in one block, and the adjacent blocks have 4 little nine patches. This makes the lines of squares connect. There are a variety of colors in this quilt, but all the background is the same. I'm hoping to have all my inner 56 blocks done by Sunday afternoon. After these inside blocks are all put together, then a thin outer border goes on, then the larger vines border will be the next big job. My plan is to invisible thread machine applique the stars on the vine. I'll update you next Friday as to my progress. I'm hoping to have the center blocks sewn together, the small border applied, and the vine borders started. 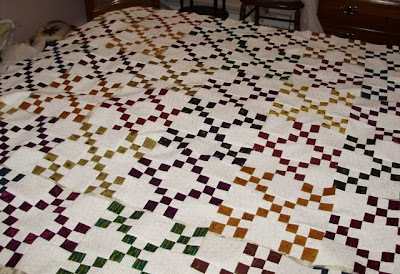 This quilt needs to be done by Jan 20, our guild meeting night. 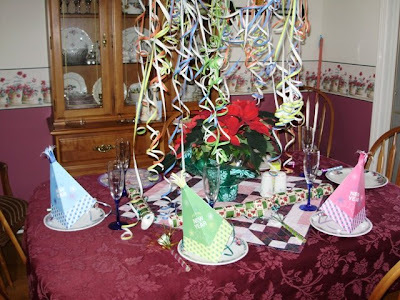 We decorated the kitchen table with hats, streamers, crackers and dug out our good china and champagne glasses for our special guests that were coming for New Years Eve supper. Can you guess who they are....? Yep, it was the Triplets. 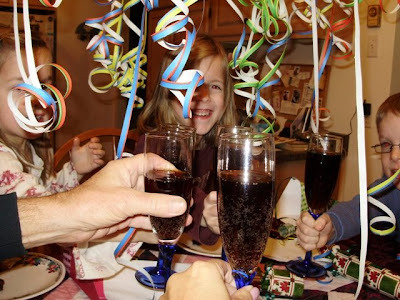 Here we are, all 5 of us, having a New Year Toast. Root beer, wings, pizza, peanut butter balls, ice cream and then the movie, ET and popcorn. That's how the triplets and Mert and I rang in the new year.